The displacement Deep-V catamaran concept was developed in Newcastle University(UNEW) through development of thesystematic Deep-V catamaran series. One of the most important Deep-V catamaran launched to date is Newcastle University’s ownmulti-purpose research vessel, The Princess Royal. The vessel was launched in 2011 and enhanced the Deep-V catamaran conceptfurther with the successful adoption of a novel anti-slamming bulbous bow and tunnel stern for improved efficiency. It was howeveridentified that the vessel has substantial amount of dynamic trim that limited the visibility of the captain. The dynamic trim also increasedthe wave-making resistance thereby preventing the vessel from attaining its maximum speed in certain sea states. This paper thereforepresents the application of devices such as Trim Tabs, Interceptors, Transom Wedges and Integrated Transom Wedges-Tabs to controlthe dynamic trim and improvement of fuel efficiency of the vessel. All of these energy saving devices were fitted into a model for testsin Newcastle University’s Towing Tank. Model test verification confirmed that the optimum appendage was the interceptors, theyproduced a 5 % power saving and 1.2 degree trim reduction at 15 knots, and investigations of full scale trials will be scheduled withand without application of device to compare the improvement of performance. The Commercial passenger ferry market has an ever-increasing demand for higher speeds and passenger comfort to meet the evolving transport requirements (Park and Shin, 1997). For this reasons there are numerous advanced hullform designs in existence and response motion should be analysed at the early design stage for passenger comfort (Gim et al., 2010). Of these hullforms competing in the high-speed passenger ferry market, catamarans are at the forefront with Deep-V applications developing into a new and emerging variant. Atlar (1997) reported in a review study of the potential application and suitability of Deep-V hullforms to catamaran concepts, something that has not been exploited fully. This application has developed through successive projects (Atlar et al., 1998; Atlar et al., 2009) and a recent PhD research, all of which resulted in the first systematic Deep-V catamaran (UNEW-DVC) series including limited model tests supporting the series development by Mantouvalos et al. (2009). 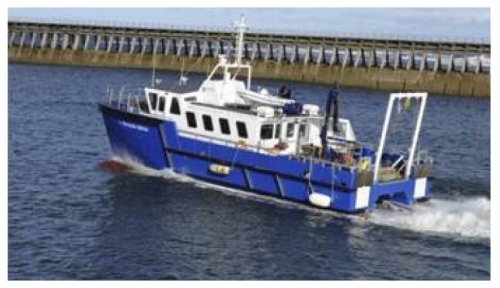 Newcastle University designed and built a Deep-V catamaran as a schol research vessel and the research vessel has large deck area, excellent stability and good speed potential with low wave wash (Atlar et al., 2010) with an anti-slamming bulbous-bow, tunnel stern and cut up. The vessel was designed to operate at a cruising speed of 15 knots and a maximum speed of 20 knots. Based on the most common operating conditions, the vessel is broadly found to be operating within a Froude number (Fn) range of 0.4 to 0.75 and hence can be classified as a semi displacement high speed craft. During the trials of the vessel, it was observed that the vessel has substantial amount of dynamic trim especially above a speed of 10 knots. This was reflected in the inability of the vessel to reach its maximum operating speed and it was noticed that the vessel could only operate at a maximum speed of 18 knots. Table 1 shows the general specification of the research vessel whilst Figure 1 shows the full scale trial at the design speed. The high trim and a sinkage during the motion of the vessel were due to the change in the pressure distribution around the ship. Unlike displacement vessel, the resistance of high speed craft is closely dependant on the trim of the vessel. 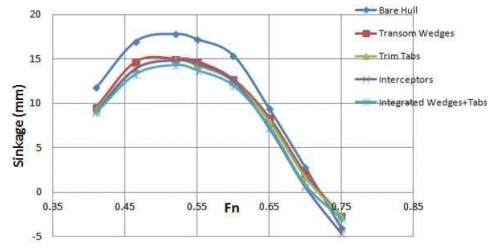 Hadler (1996) suggested that there has been an increase in the resistance of catamaran from the model tests conducted Fn between 0.45 to 0.55 and it was noticed that there is an increase in trim at this particular Fn. The interference of the wave between the two demi hulls causes an increase in the trim of the vessel which could cause the increase of resistance. The importance of the trim is more significant for transom stern vessel due to the existence of another resistance component called as transom drag. The early correction of the trim using appendages attached in the transom is a well-established method for high speed craft. This method gained popularity due to its simplicity in design and the ease at which it can be retrofitted on to a vessel. Trim Tabs/Stern Flaps, Interceptors and Transom Wedges form the main trim control devices which were suitable retrofit onto the vessel after construction. The effectiveness of all these appendages are well-known to provide favourable results in terms of resistance and trim of the vessel. The main design parameters for Trim Tabs, Transom Wedges, Interceptor are the chord length, the flap angle, the wedge angle and the wedge length as well as the height of deployment of the interceptor respectively. 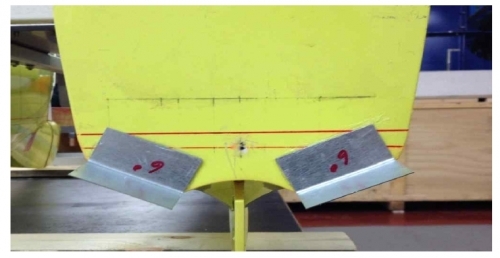 For semi displacement and planing vessel Trim Tabs can produce as much as 2 degree reduction in trim at high speed causing a reduction in the resistance (Cusanelli and Karafiath, 1997). The effect of Transom wedges was extensively studied by Karafiath and Fisher (1987) and a resistance reduction of 11% was reported for high speed patrol boats due to the dynamic trim control. The combination of Trim Tabs and Transom Wedges was investigated by Cusanelli and Karafiath (1997) using the DDG51 Class US Navy vessels fitted with integrated Wedge-Tabs and it was the reduction of delivered power by 11.6 % compared to the bare hull and a reduction of 6.2 % that was observed when compared to the 'Wedges-only' configuration. Interceptors, on the other hand, works by interception of the water flow below the transom. Lift is produced by the Interceptors due to the large increase in the pressure at the intersection of the interceptor and the transom which otherwise would have been at atmospheric pressure owing to the dry transom. (Faltinsen, 2005). Lynsdahl (2005) has analysed the change in the pressure distribution towards the stern by the deployment of interceptors at a height of 6mm using a pressure sensitive film. A substantial increase in the pressure towards the stern was observed (Steen, 2007). Interceptors also have produced very favourable results where an interceptor has caused a resistance reduction of 18% at Fn = 0.70. Within the above context, to overcome the speed loss due to adverse dynamic trim of the Research Vessel, a research programme has been established by Newcastle University into the effect of trim control on the hydrodynamic performance of the Research Vessel with four existing devices in literature and commercial, and based on the results of model tests investigations of full scale trials will be scheduled with and without application of devices to compare the improvement of performance. Hence, this paper presents the results of the various dynamic trim control options fitted to a 1/12th scaled model of the UNEW Research Vessel for experimentation and the analysis. The 1/12th scale model of the Newcastle University Research vessel was used for the test, as shown in Figure 2. The model was made of fibre glass. The appendages included with this model were the skeg and the rudder. The demi hull separation, non-dimensioned using the length of the model(LBP), was 0.3. Details of main parameters of the vessel and the model are given in Table 2 whilst the photo of manufactured model is shown Figure 2 at zero speed. Model tests were carried out in the Newcastle University Towing Tank. The tank is 37 meters long, 3.7 metres wide and 1.25 meters deep. The towing carriage is a mono rail configuration driven by an electric motor by means of a guide wire and is capable of operating up to a speed of 3 m/s in normal conditions. The range of vessel speeds selected for the test were 10 knots to 18.5 knots. To avoid any occurrence of laminar flow, turbulence stimulators in the form of wire struts were attached to the model at station 9.5 and at half the length of the bulbous bow. Once the model was set-up in the towing tank, the test matrix was developed. The model speeds selected for the test were such that they covered the range of exact operating conditions of the vessel including the design speed of 15 knots. The range of vessel speeds selected were from 10 knots to 18.5 knots. The corresponding speed of the model was calculated using Froude’s Laws which gives a range of model speed from 1.48 m/s to 2.75 m/s corresponding to from Fn 0.4 to 0.75. The resistance, trim and sinkage data recorded by the LabVIEW software during the model testing was analysed and extrapolated to full scale as ITTC Recommended Testing and Extrapolation Methods for High Speed Marine Vehicles (7.5-0.2-05-01) (ITTC, 2008). The design of the appendages was performed using data from the literature review and commercially available material. In the following sub-sections, the details of each appendage are presented separately. 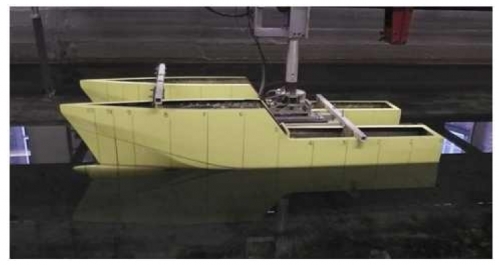 For Trim Tabs the corresponding design parameters were selected based on the range which was tested previously for the similar type of vessel and from a commercial available range. The ranges of chord length for the trim tabs were specified by Cusanelli and Karafiath (1997) from 0.5 % to 2.5 % LBP. The final chord length of the trim tabs were taken as 2.5 % LBP, these were based on the favourable results obtained by Salas et al (2004). The 9 degree trim tab was made from the dimensions measured from the model; it was attached to the model as shown in Figure 3 and Figure 4. Fig 4. Drawing of 9 degree Trim Tabs mounted at the transom of the model. A 6mm depth of deployment (model scale) was based on input from commercially available Humphree Interceptors. The detailed design for the Interceptor is shown in Figure 5 and Figure 6. The design followed the shape of the transom, however the span was kept much higher than the Humphree Interceptors until the maximum affordable span for the transom was selected. The selection of the parameters to be model tested for Transom Wedges was based on the range provided in the available CFD study by Gopakumar (2012). A wedge of length 35 mm corresponding to 2.5 % of the LBP and 8 mm of height was manufactured as shown in Figure 7 and 8 and it corresponded to a wedge angle of 13 degrees. The trim and resistance behaviour of the vessel was also analysed with an Integrated Transom Wedges-Tabs arrangement. 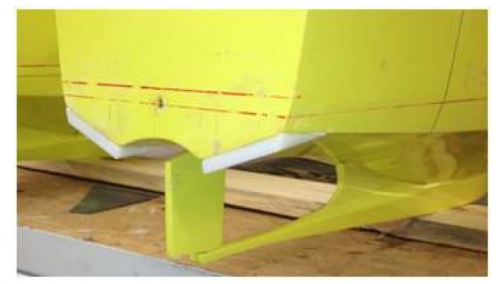 The configuration of Integrated Transom Wedges-Tabs was a combination of 9 degree Trim Tabs – 2.5 % of LBP Transom Wedges. The appendages were mounted carefully so they maintained the continuity between both parts, as show in Figure 9. 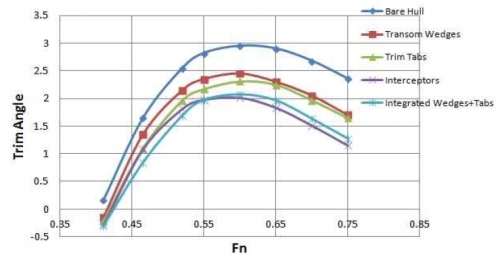 All the configurations of appendage including bare hull are tested in the semi displacement regime of Fn from 0.4 to 0.75. A comparison of the trim, sinkage, residual resistance coefficient and total resistance is given in this section. In a typical planing or semi-planing hull, the wave resistance is around 50 % of the total resistance, however by changing the trim of the boat, the wave resistance can be significantly reduced. Using this theory Figure 10 shows that the trim angle of all of the appendages reaches a maximum value at Fn = 0.6, which corresponded to the design speed of the vessel. The trim angle of the bare hull reached up to 3 degrees trim whilst four appendages show the improved control of trim angle from the decrease of 0.7 to 1.2 degrees. Figure 10 shows that the interceptor was the best way of adjusting the dynamic trim of the vessel in the high speed regime. As can be seen in Figure 11, a maximum value of dynamic sinkage at the midship occurred at Fn = 0.55 whilst a reduction in trim and sinkage occurred at higher speeds. This reduction was evidence of increased hydrodynamic lift as the ship speed increased. 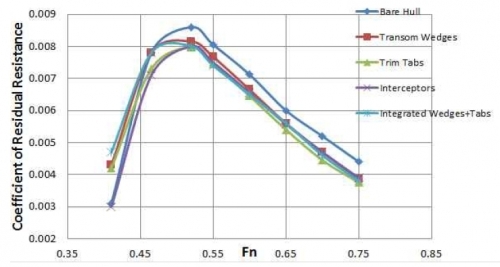 The coefficient of residual resistance and total resistance at full scale are given in Figure 12 and 13 respectively. The Interceptor demonstrates good performance over a wide range of speed whilst the Trim Tabs show the best performance for the high-speed range. All four of the appendages show poor performance at lower speed range because of considerable increase of resistance from appendages but they give a resistance reduction of 4 – 5% at the design speed and 7 - 7.5 % reduction at the maximum speed. This high resistance reduction was accomplished by the excellent trim and sinkage controls observed in Figure 10 and Figure 11. In order to achieve lower resistance and savings in fuel consumption adjusting the trim of a high-speed boat is necessary in a planning or a semi-planning mode. 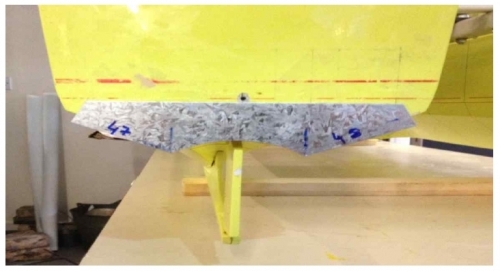 This paper presents the details of devices such as Trim Tabs, Interceptors, Transom Wedges and Integrated Transom Wedges-Tabs as a remedy for trim control for the Research Vessel ‘The Princess Royal’. 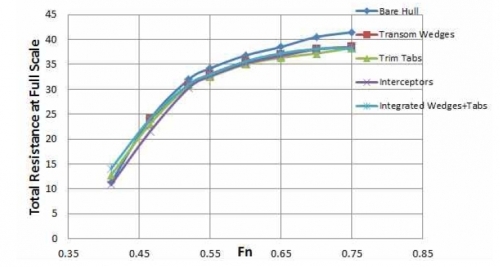 The analysed results of model tests performed using four types of appendages in the Newcastle University Towing Tank are presented along with comparison of trim angle, sinkage, residual resistance and total resistance at full scale. From the entire research study the following conclusions were drawn. 1) The investigation of experiment indicated that there was a close dependency between high trim angle and high resistance. This implied that resistance could be reduced by adjusting a trim angle. 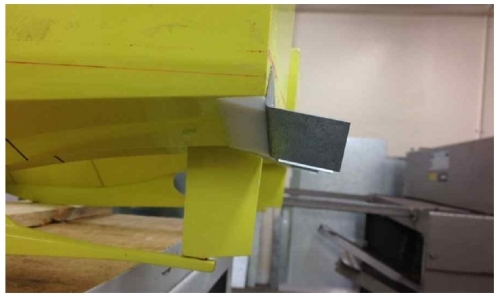 3) The investigation showed that Interceptors produced the highest trim reduction at the design speed whilst Trim tab showed a good resistance performance at the higher speed regimes. 4) Interceptors were selected as the retrofitting device based on the performance and the vessel’s main function of trawling which requires lowering down equipment at the transom. 5) Investigations of full scale trials will be scheduled with and without application of Interceptor to compare the improvement of performance and scale effects of the lift produced by Interceptor. 1.Atlar, M.(1997), "Recent Developments and the Emerging State of the Art in the High Speed Vessel World with a Personal View on Large Deep-V Hulls and their future Potential (Discussion)", 6th International Marine Design Conference, IMDC'97, University of Newcastle upon Tyne, UK. 2.Atlar, M., Haslam, B. and Mesbahy, E.(1998), "Deep-Vee hullforms and their Application to multy-hulls, 'Deep-V' Catamaran", 1st European Symp. on Yacht and Small Craft Design, University of Genova, La Spezia, October. 3.Atlar, M., Mantouvalos, A., Sarioz, E. and Sarioz, K. (2009), "A Fast Catamaran Ferry using a Displacement Type Catamaran", 13th Congress of Intl. Maritime Assoc. of Mediterranean IMAM 2009, Istanbul, Turkey, 12-15 October. 4.Atlar, M., Sampson, R., Wightman-Smith, J. R., Seo, K.-C., Danisman, D. B. and Mantouvalos, A. (2010), "An Innovative Research Vessel Replacement for Newcastle University", Proceedings of Seventh International Conference on High Performance Marine Vehichles, Melbourne, USA. 5.Cusanelli, D. and Karafiath, G.(1997), "Integrated Wedge-Flap for Enhanced Powering Performance", Proceedings of 4th International Conference on Fast Sea Transportation, Sydney, Australia, pp. 751-765. 6.Faltinsen, O. M.(2005), "Hydrodynamics of High Speed Crafts", Cambridge University Press: Newyork. 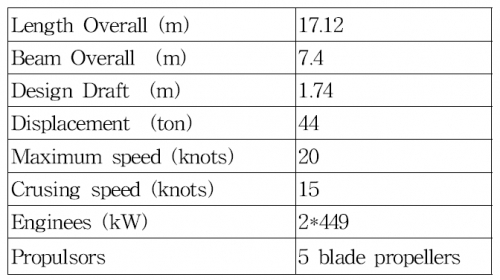 7.Gim, O. S., Oh, W. J., Shon, C. B., and Lee, G. W. (2010), "Characteristics on the Motion Response of a Catamaran power yacht", Journal of Korean navigation and port research, Vol. 34, No. 6, pp. 447-452. 8.Gopakumar, N.(2012), "Dynamic Trim Control of High Speed Craft". MSc thesis, Newcastle University. 9.Hadler, J. B. (1966), "The Prediction of Power Performance on Planing Craft", Transactions of Society of Naval Architects and Marine Engineers, Vol. 74, pp. 563-610. 10.ITTC(2008), ITTC Recommended Procedures and Guidelines; Testing and Extrapolation Methods of High Speed Crafts and Marine Vehichles, 7.5-02-05-01, 2011/7.5-02-05-01.pdf (Accessed: March 17). 11.Karafiath G. and Fisher S. C.(1987), "Effect of Stern Wedges on Ship Powering Performance", Naval Engineers Journal, Vol. 99, pp. 27-38. 12.Lysdahl, L. A. (2005), "Interceptor characteristics with focus on lift and drag", Project report, Norwegian University of Science and Technology. 13.Mantouvalos, A., Atlar, M. and Sampson, R.(2009), "Development of first systematic deep V hull form series fordisplacement type high speed catamarans (DVC Series)", Proceedings of 10th International Conference on Fast Sea Transportation, Athens, Greece, pp. 77-91. 14.Park, M. K. and Shin, Y. k.(1997), "Hull Form Design and Consideration of Fast Catamaran", Journal of the Korean Institute of Navigation, Vol. 21, No. 2., pp. 41-46. 15.Salas, M., Rosas, J. and Luco, R.(2004), "Hydrodynamic analysis of performance of stern flaps in a semi displacement hull", Latin American Applied Research, Vol. 34, No. 4. 16.Steen, S.(2007), "Experimental Investigation of Interceptor Performance", Proceedings of Ninth International Conference on Fast Sea Transportation, Shanghai, China, pp. 237-245.